Would you tell us a little more about your two new books? In this gentle, inspirational romance, Lin Stepp reveals the healing touch and deep peace the beauty of the Smoky Mountains can bring to a hurt and troubled heart. Like it or not, Mallory Wingate’s doctor and employer have sent her to the mountains to rest and heal, but the mountains and the people there always bring unexpected surprises. The Interlude is set in the Greenbrier and Pittman Center area of the Smoky Mountains between Gatlinburg and Cosby. In this lovely section of the mountains I created the fictitious Millhouse Resort and the Wingate family, who started and still run the large resort with its rustic stone lodge, restaurant, and golf course all set amid winding roads, hiking trails, and scenic mountain vistas. As a girl Mallory Wingate often come to stay with her grandparents at the resort and now, after suffering a minor breakdown, she returns to take a needed rest from her work as an editor. In an odd coincidence, she meets Millhouse’s golf pro on the plane flying in from Savannah without knowing who he is. They flirt on the trip, never expecting to see each other again… but fate has different ideas in mind. Lucas James, attracted to Mallory from the first, pulls away when he realizes she is his boss’s granddaughter. He also pulls away because Mallory’s recent breakdown reminds him all too vividly of his past wife Cecily, whose mental problems brought sorrow to both his and his small daughter’s life, and led to Cecily’s death. How Lucas and Mallory fight their attraction to each other, each for their own reasons, is a part of the story, of course, but many other side dramas unfold to keep readers guessing—like a series of ongoing thefts at the resort and an unsolved mystery of how Mallory’s father died. Readers will be further entertained with the charm of Lucas’s little daughter Suzannah, Nonnie Wingate’s Butterfly Tea Room, and trips and hikes around the area to Gatlinburg, historic Emerts covered bridge, Ramsay Cascades, and more. Set against the alluring backdrop of coastal South Carolina, Claire At Edisto takes the reader on a sweet and gentle journey showing that love and new beginnings can often bloom from the deepest sorrows. Yet even the quiet peace and beauty of a remote coastal island bring new problems as Claire Avery seeks to find her way. As this book begins, Claire Avery, a mother with two young girls, has just lost her husband Charles, the pastor of a big church in Sweetwater, Tennessee. Claire, since her marriage, has been a stay-at-home mother and an active helper in the church. She lives in the church parsonage, too, which she will now have to vacate. 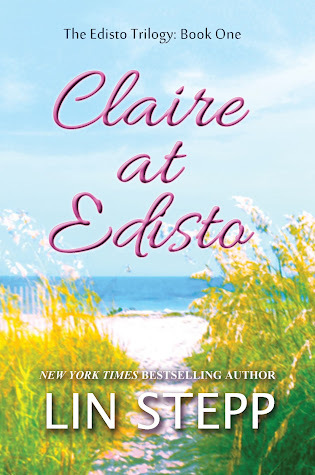 Her husband’s brother Parker Avery encourages Claire to come to his beach house at Edisto to take time to heal and decide on a new direction for her life. Claire and her husband Charles spent many happy vacations at Edisto Island with Parker and his wife, Ann, who died three years ago. Parker promised Charles he would be a help to Claire if anything ever happened to him and Parker is purposed to fulfill that pledge. Parker owns an antique store and a home in Beaufort and comes down often to the island to visit with Claire and the girls. But he is soon disturbed at Miles Lawrence’s interest in Claire, too soon after Charles’s death, and he is further shocked at his own somewhat jealous feelings about Miles’s interest. Claire finds Miles’s interest in her disturbing, too, and is almost relieved to later move to live with her parents in Arlington, VA. But only unhappiness lies there for Claire and her girls. Fortunately, some wonderful twists of fate bring Claire back to Edisto again, and to new discoveries about herself and her talents. Claire’s story is not only about her recovery from the loss of her husband, but about Claire finding her own identity and place in life. …. Threaded through this story, too, are sweet scenes with Claire and her girls Mary Helen and Suki, happy beach scenes with neighbors and friends, visits to nearby Charleston and Beaufort, ongoing upsets and worries as Claire readjusts to her new life, the threat of a hurricane, and more. It’s a warm and touching story—threaded with mystery and intrigue—that will keep readers turning the pages to see what will happen … and make them eager to read the next two books in the series. What do you like most about these two newest releases? 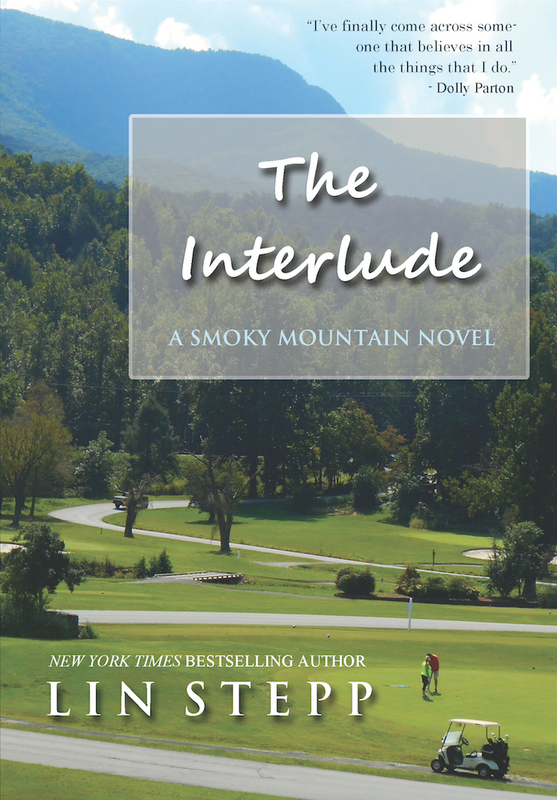 I loved taking readers to a new place in the Smoky Mountains in The Interlude. I research extensively before writing each of my books, and my husband and I enjoyed exploring and learning more about Pittman Center’s colorful history and re-hiking favorite trails in the Greenbrier area to include in the story. Rustic, historic resorts dot the Appalachian mountain area and I loved creating the Millhouse Resort for this book, too. Edisto Island, featured in Claire at Edisto, is our family’s favorite beach spot and we go to the island to vacation nearly every year and have since the 1980s. I loved looking back to the island’s quieter days in writing the first book in the trilogy, when you had to cross an old swing bridge to even get to the island. I think readers will love visiting this little known but beautiful barrier island and in stopping in at sites in the Charleston and Beaufort area. Sequels are fun, too, and the next books, Return to Edisto and Edisto Song, set in more contemporary times, follow Claire’s girls Mary Helen and Suki when grown. Would you tell us a little more about the characters from THE INTERLUDE? Mallory Wingate, the main character in The Interlude, is an associate editor for Whittier Publishing. Her father Jarrett was killed in a hunting accident when she was small and she moved often with her mother in the years to follow with Delores Wingate’s frequently changing jobs. A constant, steady influence in Mallory’s life was always her father’s parents Beau and Nonnie Wingate, who owned Millhouse Resort in the Smoky Mountains. Mallory’s early life is filled with fond memories of happy vacations and long summers with her grandparents, so when a series of harsh events cause a nervous breakdown, she goes to their home for a doctor-ordered recovery. Ordinarily a strong, confident woman, Mallory hates the fact that she’s suffered a breakdown, disrupting her work and her life, and mostly caused by the stress of caring for her mother before she died. But after arriving at her grandparents, she soon realizes a time of rest is just the break she needs. Lucas James, after a long season on the Pro Golf Tour, takes a new job as the golf pro for Millhouse Resort after life problems create difficulties for him as a professional golfer. He also takes on the care of his small daughter Suzannah after his wife Cecily dies. After his problems with Cecily, Lucas shies away from involvement with Mallory when he learns she’s experienced a breakdown… so The Interlude is filled with the ups and down of this couple attracted to each other but often trying to avoid each other for their own reasons. The warmth and wisdom of Beau and Nonnie Wingate and of Elizabeth McGill, Lucas’s sister, who becomes Mallory’s friend, add so much to this story … as do the charming antics of Lucas’s little five-year-old daughter Suzannah and Abby, Elizabeth’s daughter. Friends and staff around the resort also enrich the story’s plot, create testy problems, and help to unravel a few mysteries. Two cat characters Mr. Tom and Babycakes, Suzannah’s cats, bring a lot of fun into the story, as well—and the surprise of kittens. Would you tell us a little more about the characters from CLAIRE AT EDISTO? Parker Avery was born on farm in Walland, Tennessee, but didn’t follow the traditional pattern of most of his brothers and sisters—and neither did his brother Charles, knitting them together as they grew older. Charles became a minister and Parker a businessman and the owner of Westcott Antiques in downtown Beaufort, SC. Even when the brothers married, they stayed close, and Charles and his family always came down to Parker and Ann’s beach house at Edisto Island. When Ann died, Charles provided warm comfort and support, and Parker promised Charles if anything ever happened to him, that he would look out for Charles’s wife Claire. However, he never expected that favor to come due so soon. Claire Hampton Avery was raised outside Washington, DC, in an affluent family in which she always felt like the black sheep. It was a joy for her to meet Charles, who loved her as she was, which made it even more devastating to her when he died unexpectedly, leaving her with two small girls and no idea what to do next with her life. Claire is sweet, kind, smart, creative, and loving, but she gentle, too, and lacking in confidence. She has been a stay-at-home mother, not working except in volunteer efforts, and her gifted artistic and creative efforts have only been applied to home crafts and projects to entertain her children and the children in the church. Loving Edisto as I do, I had a wonderful time creating the secondary characters in this book—Parker’s and Claire’s somewhat difficult families, Claire’s charming little girls Mary Helen nine and Suki five, Parker’s friends and colleagues in his antique business—Drake, Nora, and Nora’s little boy Andrew, all the warm-hearted Edisto neighbors like the Whaleys, Mikells, and Comptons. And of course Miles Lawrence, attracted to Claire, and always challenging and analyzing her, as well as troubling Parker in more ways than one. I think readers will love all these rich low country Southern characters. What do you find most challenging and most rewarding about being an author? It has been a joy for me at midlife to become an author. Graduating in education, I spent my first work years in educational sales, and then in other sales, public relations, and marketing arenas, returning to get my doctorate later and then to teach college for almost twenty years. Old, early dreams of writing got put on the back burner by the need to help provide a living for my family and the practicalities of life. But as one of my favorite sayings reads: “It’s never to late to be what you might have been” … and my time for writing finally came. I am greatly enjoying this “second adulthood” season as an author. How could you not feel rewarded to see published sixteen books on the bookshelf and more coming? The most challenging aspect of becoming an author was realizing the huge job responsibilities than are a part of being an author besides just writing good books. I thought I’d be like John Boy Walton, sitting back on the porch, writing my books, and getting for a little check in the mail every now and then. Instead I soon learned that authors are heavily involved in all the marketing, public relations, and sales of their books, that they’re expected to do book launches, book tours, sign at bookstores, speak at events, engage in social media, and a myriad of other business tasks. … Blessedly for me, I’d learned all those tasks as a businesswoman and professor, and fortunately, as well, I’m an extrovert by nature and love getting out into the world of people as well as writing. But a writer’s life is a lot of hard work. I speak often for writers’ groups and counsel young authors, and their misconceptions about being an author are similar to my early misconceptions. They imagine they’ll write a book and then get the “Miss Piggy Rich and Famous Contract.” They naively believe that a publisher does all the behind-the-scenes work for an author related to business, marketing, and publicity. Most believe any first book they write is “beautiful and perfect” the moment it is birthed and they are shocked when they go through their first big edit with a major publisher. For many the realities of becoming an author are like learning there is no Santa Claus—very disillusioning. My only other tip for aspiring writers is that if they want a career as an author they must put in the work time a real career demands. Few want to do that. They hoped becoming a writer would be an easy life and are disappointed as soon as they uncover the reality that writing is hard work like any other job—demanding self-discipline, long hours, serious time management, self-motivation, and often little remuneration. If someone is still eager to try becoming an author, I offer fellow-author Carolyn Jourdan’s advice to get that first book written: “Start your book; write a whole lot; finish your book.” Few ever get this far. What genre do you read when you grab a book to relax with? I was going to add on the last question that I worry about the success potential of any potential author who doesn’t read a lot. Most all successful writers began as avid readers. There is something about reading that teaches you inherently what a good book is like. Since I discovered the public library as a little girl, I have always been an avid reader. Reading is my evening reward for getting my writing work during the day. I always have a stack of books waiting that I am looking forward to getting into. … I especially love Southern fiction and both contemporary and regency romances. I love mysteries, although not the bloody, true crime type or those with too much graphic detail. I also like books in my psychology field, and I often pick up self-help and inspirational titles. Life is simply better with books! In writing, as in other aspects of my life, I usually have multiple projects ongoing. With my twelfth, and final, book of the Smoky Mountain novels publishing, I am starting into a new series of mountain-set novels called The Mountain Home Books. Right now I am plotting a book in this new series set in Dandridge, Tennessee, and with the weather warming here in East Tennessee at last, I hope to head to Dandridge to visit, tour, and map around the area this weekend. My husband and I are also working on a devotional book, alternating in writing the daily devotionals for the year … which we are sandwiching in around other projects as we can. This spring we are also starting a new regional guidebook, which means we will get to hit the road to visit all the spots we will focus on and take photos of. Always fun!! Around these new writings, I’ll be working with my editor in the months to come on edits for my next books publishing in 2020—HAPPY VALLEY, the first book in the new Mountain Home series, and RETURN TO EDISTO, the second book in the Edisto Trilogy. I often say that as long as readers keep loving my books, I’ll keep on writing them! Lin Stepp is a native Tennessean, businesswoman and educator. A New York Times, USA Today, Publishers Weekly, and Amazon best-selling international author, Lin now has sixteen published books, including her twelve beloved Smoky Mountain novels set in different locations of the Tennessee and North Carolina mountains, as well as a Smoky Mountain novella in one of Kensington’s Christmas anthologies. In addition, Lin’s first novel in a new Edisto Trilogy recently released, set on the South Carolina coast. Lin and her husband also write regional guidebooks, including a Smoky Mountain hiking guide and a Tennessee state parks book. 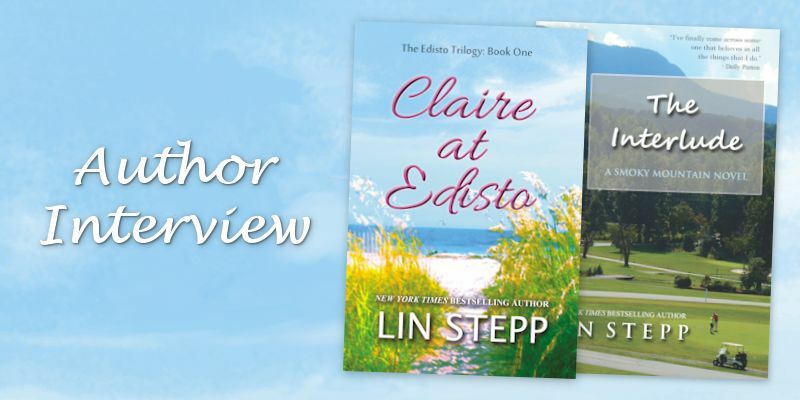 Stepp’s latest 2019 releases are The Interlude, set in the Greenbrier and Pittman Center of the Great Smoky Mountains and Claire at Edisto set at Edisto Beach, South Carolina. Lin enjoys keeping up with her readers on Facebook, Twitter, and through her monthly blog on her website at: www.linstepp.com. Have you read any of this author's books? Any thoughts on her interview?